Ticket Inspectors provide a service to our passengers on all our train services and you are there to also assist the Guard. To many of our visitors you will be the face of the Railway, as you could be the only volunteer they talk to during their visit. 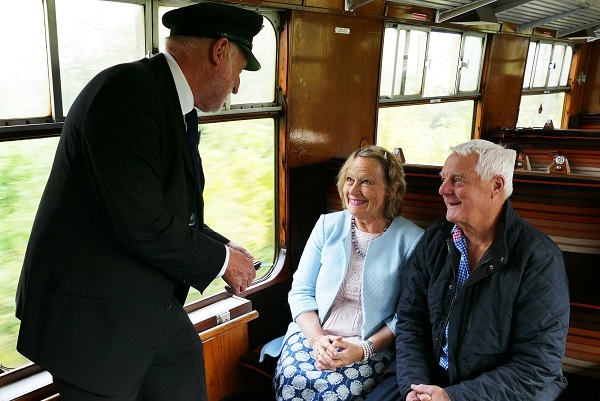 Your main duties will be to clip tickets, talk to passengers, help them with questions that they ask and be an ambassador to the GWR. Work is on both diesel and steam trains when rostered. You may also find yourself checking and clipping tickets on the platform during special events such as galas and acting as crossing monitors if the need arises. The obvious part is that you will be required to clip tickets and to make sure that passengers have the correct ticket for the journey! In addition there are quite a few "train" duties. For instance making sure all doors are closed before departure from all stations and halts, giving the Guard a hand signal to confirm all are correct. As trains arrive and depart you need to watch to ensure no one tries to open a door while the train is moving. Assisting the Guard by keeping a good look out at certain points of the journey is also important. Before the departure of the first train you will be required to fill the train's water tanks from the trackside equipment (just like connecting a garden hose) and check that the train is clean throughout, including the toilets. Then to check the toilets have adequate supplies for the day. Under direction of the Guard you will unlock the train before the start of the day and help secure it at the end of the day, when you may be required to stay with the Guard for safety reasons while he undertakes shunting duties. During the day you will help keep the train clean, helping to sweep it out at the end. Our passenger totals come from the count of all passengers on all journeys that you do. Any problems that occur should be reported to the Guard. The basic uniform is a white shirt or blouse with dark trousers or skirt together with black jacket, black shoes, and socks. A blue company tie and peaked cap are also required. In addition you will need an Orange High Visibility Vest, rain coat, torch, and clippers. This position can be dirty at times so gloves are needed to perform some of the duties. You will be given a name badge which you will be expected to wear and when you pass out a Company logo badge for your cap. The duty starts an hour and a half before the first departure of the train to ensure that it is ready to receive passengers and lasts until the train has been cleaned and secured at the end of the day. Please remember that this is not a 9 - 5 position and in the unlikely event that things go wrong, you may be required to stay later to assist. This is Britain so the sun is not always shining and this position requires you to be out in all weathers. These are rostered positions where you can volunteer for the days and locations that suit you best. You will be expected to keep to your promise of working on those days when you say you will. Volunteers are occasionally required to communicate with other members of the department at the end of a duty to pass on important information. Rostering is achieved via the Heritage Operating Processing (HOPS) web site, so access to the internet is advantageous as is e-mail. If you do not have this the onus is on you to ensure you have the information you need. Volunteers work as part of small unsupervised teams so we expect them to act responsibly and use their initiative if necessary. No specific fitness levels are required, although you should be prepared to be on your feet for a considerable period of time and you will be required to climb up and down off trains in the sidings at times, especially on Gala days. You will also need good red/green colour vision and have eyesight similar to that required to hold a driving licence. Experience in Customer Service is not essential. The most important qualities are a friendly manner, enthusiasm, a sense of humour and a willingness to help. Full training on all aspects will be given and ongoing support is available. This is an opportunity to make new friends and gain satisfaction from making a significant contribution to the railway. Of course, full training will be given as this is a safety-critical role. You will learn about railway terminology and trackside safety as well as your specific ticket inspector duties. Qualifying as a TTI is, for suitable candidates, the first step to becoming a Guard.